The Republican tax bill is now the law of the land after President Trump signed it Friday morning. The largest rewrite of the tax code in the world’s largest economy of the past three decades will have far-reaching economic and political consequences. Some will be immediate and expected while others will be unpredictable happen long in the future. It stands to reason that since the richest Americans also pay an enormous percentage of the taxes in a time of massive income inequality, that a significant part of a $1.5 trillion tax cut would benefit the upper class. But the top 5 percent richest people will also disproportionately benefit from this plan than the bottom 95 percent, according to a new analysis by the Tax Policy Center. 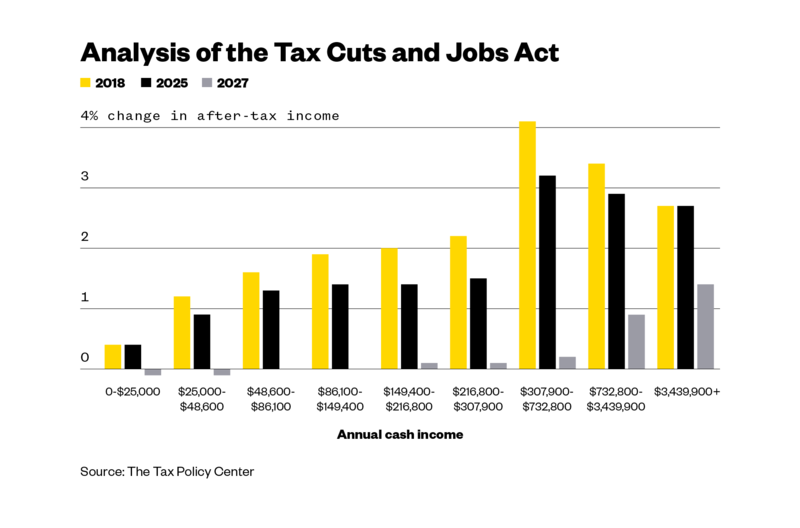 Beginning in 2018, people making over $307,900 a year will see the proportion of their after-tax income increase significantly more than people making less than that. That trend will continue as the individual tax rates begin to automatically expire in 2025. Republican leaders insist that will not happen and that they only set for them to expire in order to abide by the complicated Senate budgetary rules. But there’s no way to know what the economic landscape and national debt will look like in 2025 and no guarantee that the cuts won’t expire. The bill is very unpopular but voters also don’t understand it. Will they by the 2018 midterms? Public polling over the past five weeks consistently shows that the overwhelming majority of the public does not support this tax plan. Conservative and liberal groups have already spent tens of millions of dollars defending or attacking the plan and that’s expected to only be a downpayment on what is sure to be a very expensive 2018 campaign. But polls also show that most Americans don’t believe they are going to get a tax cut even though about 80 percent of taxpayers will in 2018. A Wall Street Journal/NBC News this past week showed that only 17 percent of people believed they would see their taxes decrease while 32 percent said they would pay more. That’s not true. While the immediate benefits largely go to the wealthiest people in the country, the vast majority of taxpayers will see a tax cut in 2018. The politics are tricky though and it’s unclear if people’s opinions will significantly shift before the important midterm elections in 2018. People may not notice the tax cut until April of 2019 when they file their 2018 taxes. It’s possible they may notice that less of their paycheck is being withheld but Democrats remember (and resent) that they did not receive any credit from voters in 2009 when President Obama’s stimulus package cut taxes for 96 percent of households. In the 2010 midterms, Republicans routed Democrats. Donald Trump has sold this tax bill as a giant Christmas present to the country. And corporate America has done its part to support that message with a series of Christmas bonuses to their employees that they are attributing to the large slash in the corporate tax rate from 35 percent to 21 percent. These bonuses are a relatively small portion of the billions of dollars they are expected to keep rather than pay in taxes, and at least one (AT&T) had been previously negotiated with a labor union before the tax break was made official. The permanent corporate tax cut is the centerpiece and most expensive part of the new tax code. While Republicans claim it will jump-start the economy and increase the amount of money brought in by the Treasury, nearly every independent analysis has shown that it will result in hundreds of billions of dollars less in federal tax revenue.